1.Package:2 training wheels, 2 sleeves,2 wheel bolt, 2 screws, 1 extend bolt, 4 flat washers. 3.Sizes:Suggested bicycle sizes: 18"- 22"
3.Applicable for: Variable Speed Bicycles,not the ordinary style. 4.Weight capacity:100 lbs,but the load of 70 lbs or less may be more suitable for the wheels. 5.Material:Hight quality steel and durable, anti-slip,anti-shedding rubber tire. 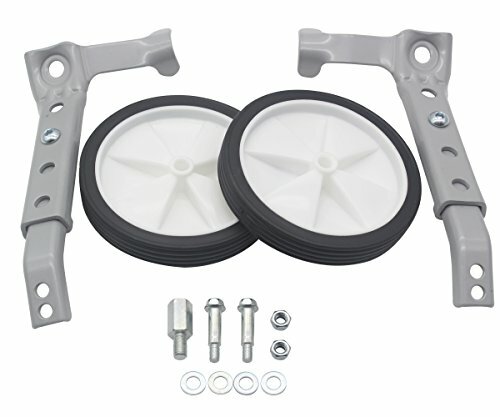 PACKAGER INFORMATION:2 training wheels, 2 sleeves,2 wheel bolt, 2 screws, 1 extend bolt, 4 Flat Washers.Please note that there's only ONE extend bolt, installing on the side of Variable Speed wheel. SUITABLE FOR BICYCLE SIZES:These training wheels are suitable for 18 to 22 inches children bicycles. WEIGHT BEARING CAPACITY:These training wheels can bear the weight of 100 lbs,but the load of 70 lbs or less will be more suitable for the wheels.They can bear children's weight without security problems. NOTE:Some bikes like those one-armed-frame bikes and bikes that rear frame tail hook angle are particularly large are not suitable for this training wheels. Pleases make sure that the training wheels are 1/4 to 1/8 in higher than the ground. INSTALLATION INSTRUCTIONS: Please refer to the installation instructions for installation details.